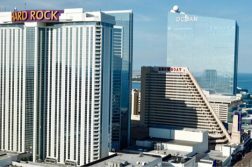 The project, built on a South Inlet Boardwalk site purchased by Morgan Stanley in 2006, invariably was the talk of Atlantic City at the annual East Coast Gaming Congress. But gaming industry experts on various panels starting in 2008 kept pronouncing it “re-VELL” instead of the intended “REV-el” (as in, “enjoying oneself in a lively and noisy way, especially with drinking and dancing”). For some, Morgan Stanley walking away in 2010 with a $1 billion loss was all they needed to know. But thanks to a $260 mm tax incentive offered by the state of New Jersey (if the project had succeeded), new investors flowed in. In 2011, Revel CEO Kevin DeSanctis — after what I was told was some significant arm-twisting by then-Governor Chris Christie — announced at the Congress that the grand opening would come the following spring. I watched DeSanctis and Christie celebrate the grand opening, which hit its target. Nothing else did, alas — including a failed pitch by Christie to have his favorite rocker, Bruce Springsteen, perform at the site on Labor Day weekend 2012. 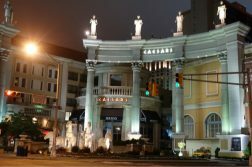 Like Trump Taj Mahal Atlantic City in 1990 before it and Resorts World Catskills after it, Revel’s first-month revenue numbers painted a devastating picture: If a casino can’t even produce enough dollars to handle its monthly debt service in its ballyhooed first weeks of opening, there is little hope for the longterm. There were numerous misfires in the planning stages. A decision to go completely smoke-free, an odd set of elevators and escalators, an inconvenient floor plan, and a relatively isolated location all more than negated the plus of a few popular nightclubs. A Revel bankruptcy filing took less than a year, though the property vacated that scenario once more than 80% of the equity was flipped to its key lenders. 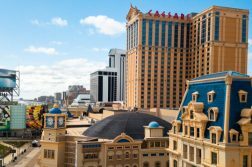 The casino closed in early September 2014, leaving an empty shell and a variety of investors mulling what kind of discount they might get. In April 2015, Palm Beach, Florida billionaire and polo player Glenn Straub bought the property for a paltry $82 million. A legal battle with the energy supplier to the property occurred almost immediately, and Straub proved to be a volatile owner. Six months after purchase, Straub suggested he would let refugees from Syria occupy the empty casino hotel until he sorted things out. Straub also touted his plans for a “genius university,” a longevity institute, a rope-climbing attraction, and other offbeat ideas. But after two years, he sold the property in early 2018 for $200 million to investor Bruce Deifik’s AC Ocean Walk group. Straub didn’t double his money because of significant legal fees incurred and infrastructure costs, but he came out ahead. Last June, Revel re-opened its doors as Ocean — with the former Taj Mahal property re-emerging as Hard Rock Casino the same day. I spoke with Deifik after the grand opening ceremony, and he seemed completely invested, emotionally as well as financially. The reboot was impressive architecturally, and the decision to open up the back doors to the Boardwalk and the Atlantic Ocean was appealing. The sportsbook is impressive, too. But month after month, Ocean landed near the bottom of the Atlantic City casino rankings, just as its predecessor did. Last week, it was confirmed that Deifik is out, and the casino’s lenders are taking over. Ocean is now owned by Luxor Capital Group (no relation to the Las Vegas casino). Part of the transfer included a, well, Revel-ation of the casino’s finances. It lost $3.2 million in September, $4.1 mm in October, $5.5 mm in November, $5.8 mm in December, and was on track to lose at least $5 mm more in January. The new owners say they will spend another $70 mm on upgrades, but it’s difficult for any of us who have been around since this whole idea was hatched to have much faith in a happy ending at this point.